Why exactly one female picks a particular male is a mystery, but it works for the pair. Soon, they are engaged in a ritual mating dance. I've seen pairs be very protective and even affectionate with one another, as in this photo - one of my personal favorites. 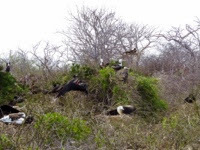 But note too that the female is far larger than the male, an interesting anomaly of the species. Together they build a nest, with the male providing the material and the female doing the actual construction. 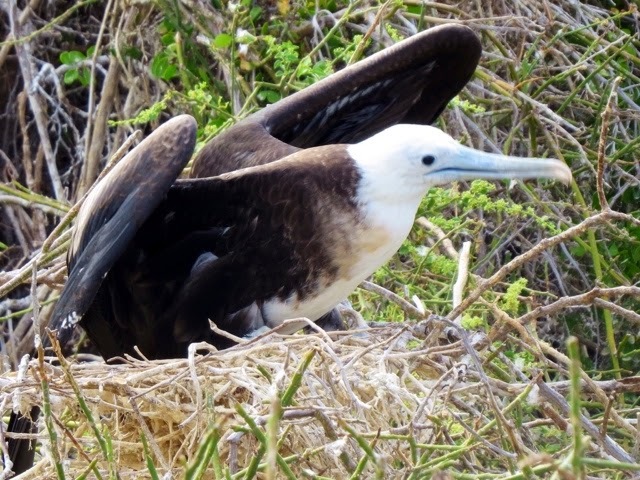 Once an egg is laid by the female, the male and female take equal care incubating and protecting it. Sometimes the male goes for food, sometimes the female. Either way, the egg is protected by the other part of the couple. 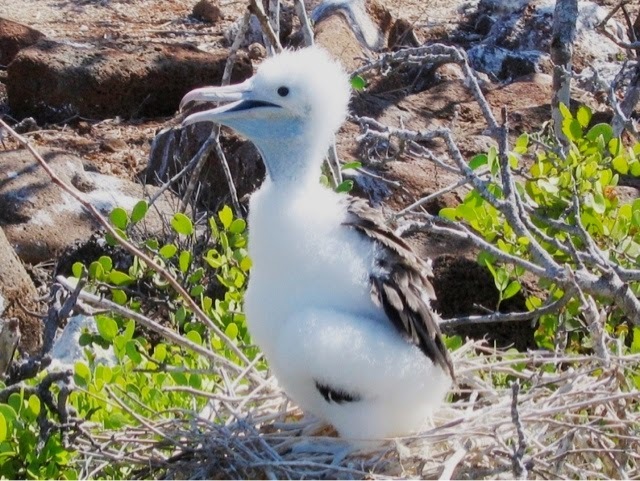 It takes just about two months before the egg hatches. 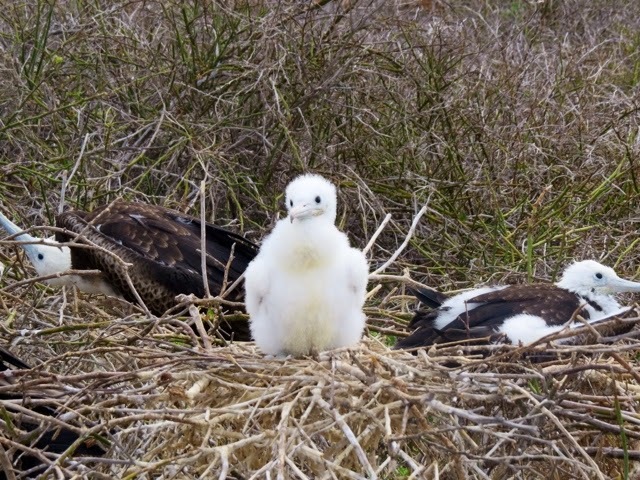 Even after the chick is hatched, the parents take equal responsibility for providing nourishment in the first two or three months of its life. 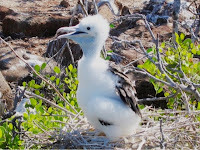 To get the baby's food, the parent flies out to the sea, swoops down and steals their catch from weaker marine birds, and then brings it back for the baby. 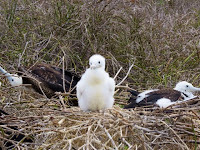 Ultimately the male will leave the nest before the female - and before the chick is fully fledged. The female will stay with the baby another three months until the chick is able to fly. 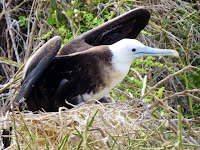 Thus, a young Frigate Bird actually is taken care of by its parents well into adolescence. Because of the weight of its wings, a newborn may take as long as 5-6 months before it can support its own weight and fly. Even then, it has to learn how to be a pirate before it can fend for itself, requiring that the female remain with the adolescent bird for as many as nine additional months. The length of time it takes for the chick to be independent makes for another interesting fact. 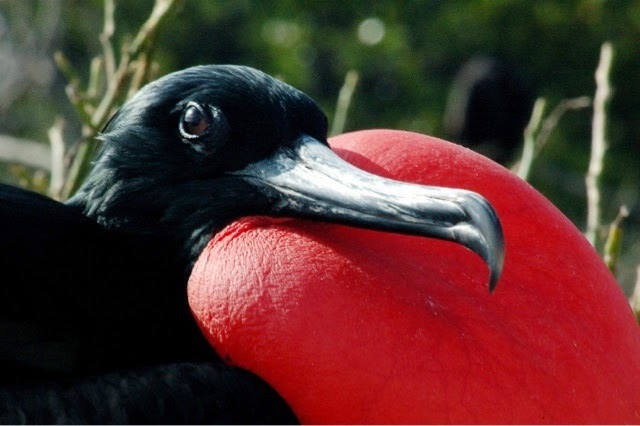 Because the male frigate bird is "off duty" after just about 12 weeks, it can mate every year. The female, on the other hand, has at least 10-12 months to dedicate to the newborn, thus is takes a new mate only every other year. 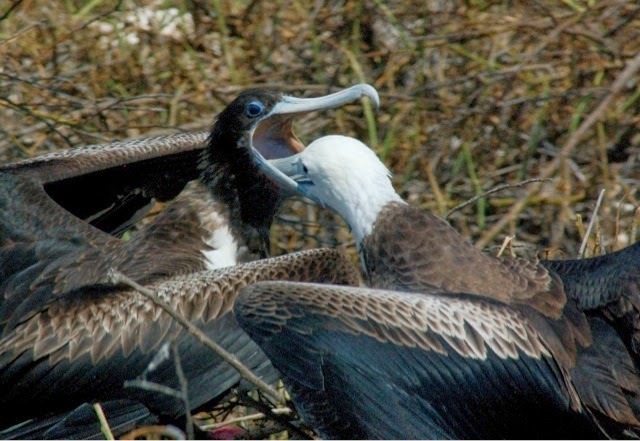 In this way, the total population of Frigate Birds stays stable. 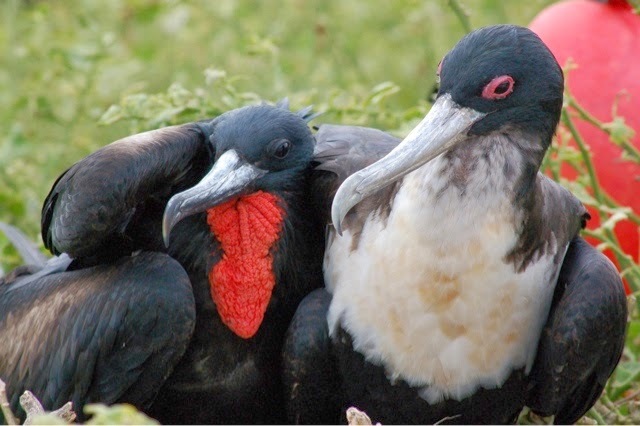 For more information about the Galapagos Frigate Birds see my earlier posts Pirates of the Sea and Great and Magnificent.